The day that Knox passed away, I purchased an oil painting at a local antique mall. The old painting was kind of expensive (for me) but it was a landscape of Yosemite that reminded me of home and had great billowy clouds that resonated with my “grieving soul” at that moment…so I bought it and wrote-it-off as retail therapy/a tribute for Knox. The old painting hung on a wall in my living room for about a year…unframed, discolored from age and abuse from previous owners over the past 100+ years. There appeared to be a signature at the bottom of the canvas but I could not decipher the name. Out of curiosity a few weeks ago, I finally decided to try and do some research. 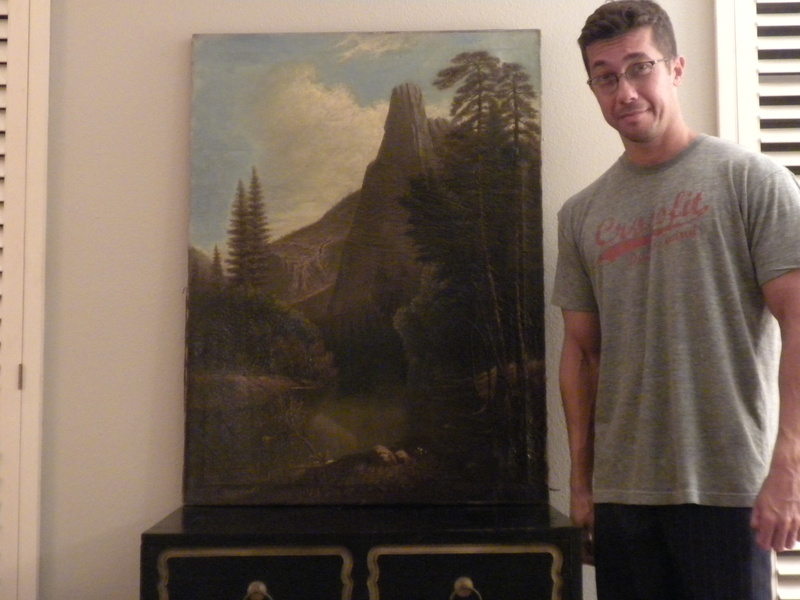 I Googled “19th Century”, “ Yosemite”, “oil painting” in all sorts of combinations. Of course the big names like Bierstadt appeared. But his stuff really looked much grander than my poor old painting. But one of the links that appeared in my search led me to a gallery in San Francisco , so I decided to give them a call – expecting that they would turn away my “poor-man’s antiques road-show” inquiry with a mean laugh or some other verbal rolling-of-the-eyes. To my surprise, they did not immediately hang up the phone. But I was told that the gallery did not specialize in this genre of art and that I should contact the North Point Gallery instead (also in San Francisco ). The owner of the North Point Gallery was very nice and after I emailed a few pictures to him, he wanted to see it in person as it was “in the manner of Virgil Williams”…an artist that I had never even heard of before. Virgil Williams was a contemporary of Biesrstadt…the famed painter of 19th century Yosemite. Which would mean that my sad painting could be of great importance. The possibility that a museum-worthy painting was hanging on the wall of my living room was very exciting. I received a special box to ship the painting and sent it to San Francisco. Meanwhile, I started to think about what color I should choose for the Porsche (with VIRGL vanity plates). After careful evaluation by the experts – the results were in, and the mystery was solved. The artist was Henry Frey – an artist that was discredited in a review published in the San Francisco Evening Bulletin of August 20, 1868 as a PLAGIARIST. SO – no Porsche. My painting is a fake Virgil Williams produced by a 19th century rogue artist. Now, I would be lying if I said I wasn’t a little disappointed. But it was an exciting process and I sure did learn a lot about the art world (did you know that a painting with human figures in it would be more valuable than a painting without?). 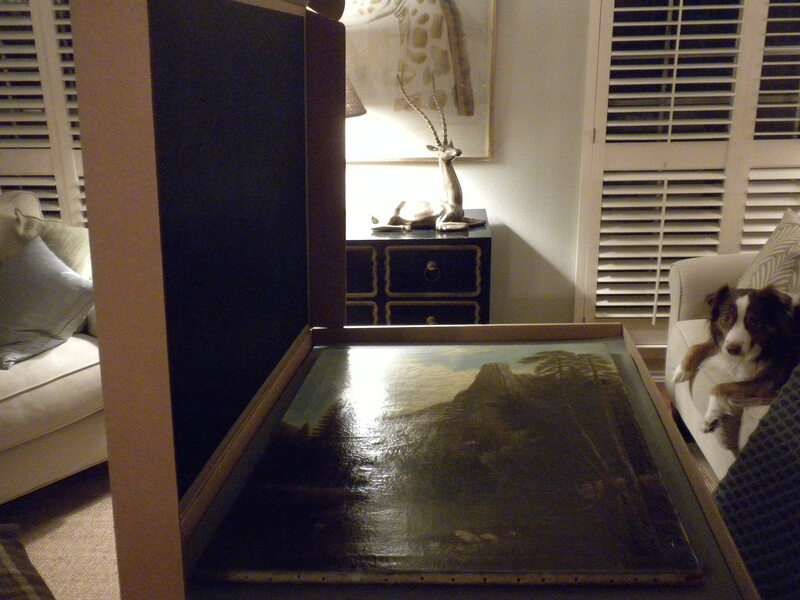 I was also really impressed with the nice people at the North Point Gallery who spent a great deal of their time to help me learn the story of an old oil painting held together by threads and some tape. In hindsight, a new Porsche would have been nice…but it would have made me sad to let the painting go considering the circumstances by which it came to be mine. And even though it’s not by Virgil Wiliams or museum worthy, it means a lot to me. And the fact that it’s the work of a scoundrel kind of makes it more endearing…. 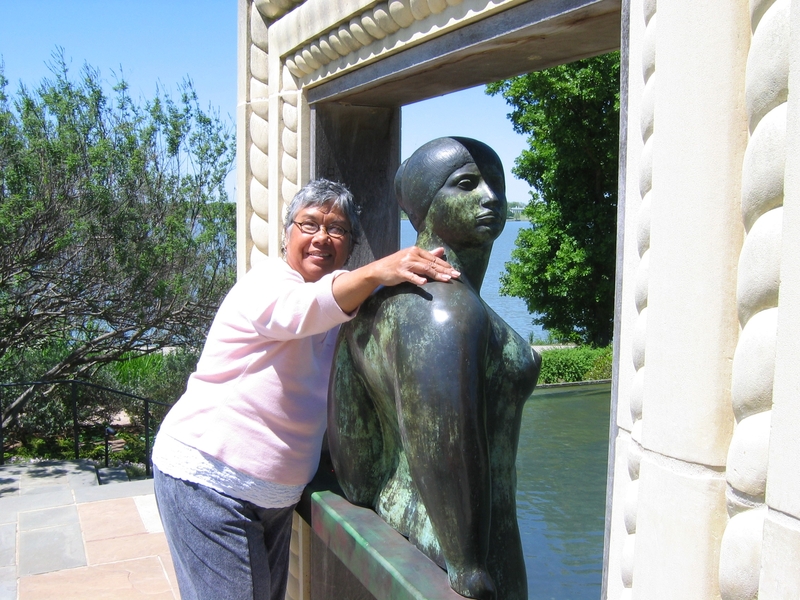 If you are ever in San Francisco – please drop by the North Point Gallery and say hi to Jessie and Alfred for me!